Doesn’t get much greener than that! Appearance: Faultlessly clear, on swirling, it leaves a thin clear coat on the inside of the glass which then transforms quickly into legs and droplets. First Impression: Cream of wheat nose, oily, spicy, noteswith a nice heavy bouquet of real vodka – not some sissy water of distilled to death vodka and distilled water. Purity of essence. 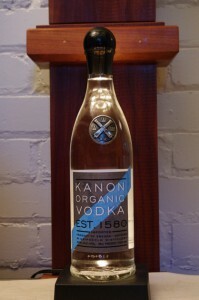 Taste: Slightly viscous/oily mouth feel on the tongue, with a nice solid mineral body to it (in a refreshing change Kanon uses deep aquifer well water – not some tasteless deionized fear of flavor designer water). A lovely hard water/mineral skeleton upon which the body of the vodka depends. Mild, crisp bite to it with a mild and pleasant warming. Lovely lingering finish with mineral and grain notes and a slight and (unlike many) fully natural mild touch of grain sweetness at the finish. Drinks: Excellent vodka martini that stands up to an olive or twist. Worked well with every other cocktail recipe we used. Adda a nice texture from the grain and the mineral notes added depth in a way many vodkas don’t anymore. Excellent straight up at room temperature – try doing that with Avian Fashion Victim Vodka! NOTE: Use Noilly Prat, and keep the vermouth refrigerated after opening for the best taste. Bottle: Thick clear pressed glass made from 60% recycled glass with a nice balance and feel. Silver/pewter heraldic medallion and nicely done graphics with lovely embossed technique printing. The glass bottle has nice lines to it with a glass foot reminiscent of a artillery shell rim/lip with a nice flow to the slightly oversize mouth ending in a black screw off top is shaped like a cannon ball. A refreshing change from the sea of frosted glass vodka bottles and nicely reusable. Final Thoughts: A very well made vodka with a good backbone of taste to it- unlike many on the market today who try to be (at best) as tasteless as possible. Think jazz versus muzak and you get the picture. Price is very reasonable – cheaper than Grey Goose and frankly infinitely better.